The Birdist: A Big Day in D.C.
A Big Day in D.C.
A crack team of legendary birders saw 136 species in the District of Columbia on May 6, 1989, and on May 6, 2015 I joined two friends to take a shot at the record. 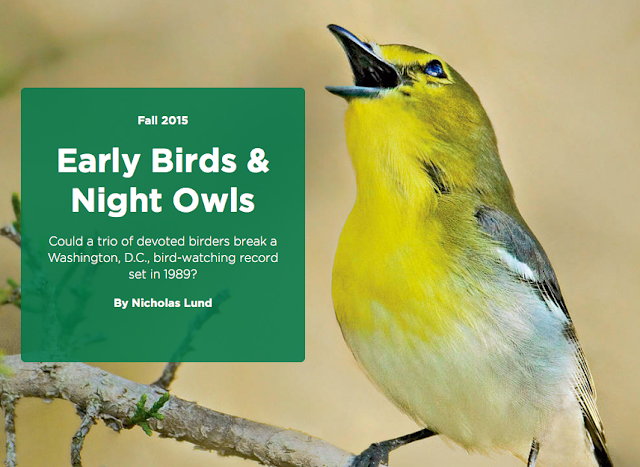 I wrote about our attempt for National Parks Magazine (any day spent in DC necessarily means a lot of time spent on National Park Service land), and the article is now available online. Did we break the record? Click here to find out.